Ray James’ works typically feature a geometric grid of undulating squares. 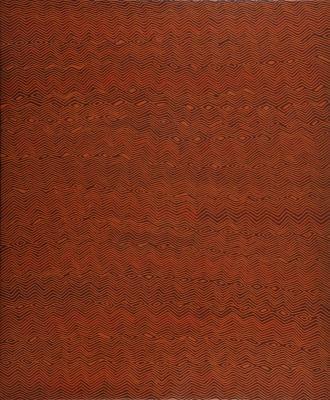 This piece however, features dotted lines of fine rolling waves in reds, giving the impression of heavy clouds rolling across a darkened sky and rain falling all across the canvas. Some aspects of this painting are secret and are known only to the initiated. However, we do know that it depicts the site of Yunala, which is west of Kiwirrkurra and is where a large group of mythological Tingari men camped before they travelled east to Pinari, north-west of Kintore. While at Yunala, the Tingari men collected bush banana, an edible root otherwise known as silky pear vine (Marsdenia australis), which was readily available throughout the area. 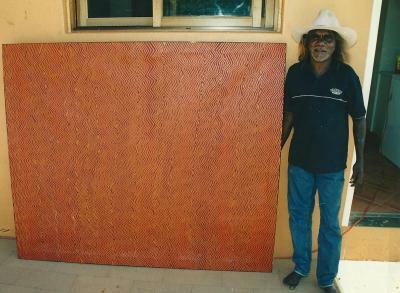 Ray James Tjangala is the son of Anatjari Tjampitjinpa (1927-1999), one of the founders of the Papunya Artists Collective. Ray James was born around 1958 in the bush and in 1963 left his traditional nomadic lyfestyle and moved to Papunya with his family. 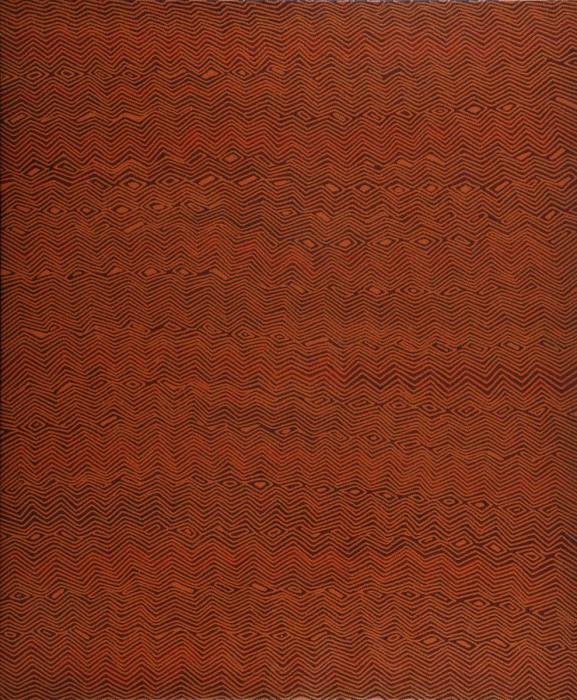 It is noteworthy that Ray's friend, Yala Yala Gibbs Tjungurrayi, one of the first painters of Papunya and an authority on ceremonial a . . .